So something really important happened to me yesterday evening – I became a Kiwi! I was born and raised in the UK which (for the avoidance of doubt) I still love. However, I have happily been a permanent resident of New Zealand for 8 awesome years. There was no pressure on me to go further and apply for citizenship. Indeed, to do so would require a bit of effort on my part and some money to pay the Ministry of Internal Affair’s administration costs. There were about 180 candidates for citizenship, representing over 30 different countries. The ceremony kicked off with an excellent performance from a Kapa Haka1 group. The Mayor of our city, ably assisted by a linguistically impressive2 MC, presided over the ceremony and did a brilliant job of welcoming us, making us feel at ease, running a tight ship for oaths/ affirmations, certificates, photos (and trees!3) and finally congratulating us. The National Anthem was sung. But, just before the National Anthem, we watched a short video…. …and within that video was a welcome from the Hon. Peter Dunne, Minister of Internal Affairs. and that this is not the case for all countries around the world4. …and as such, we’re not becoming citizens in exchange for such rights – it isn’t for personal gain (in a ‘do this to get that’ kinda way), it is because we want to! Indeed, some people will be choosing to surrender citizenship5 from their country of birth. Now, I hadn’t formalised it as such…but, yes, Mr Dunne had ‘hit the nail on the head’. There was no need to become a citizen, but we feel part of this community and want to belong to it. In fact, they do so as if this is all rather obvious, and the only way to go about running an organisation. But all of these things are extrinsic. They aren’t because you want to, they are because you want the prize available for complying with their wishes. This reminds me of a very early post I wrote titled ‘Don’t feed the animals’ which sets out and explains the point. People will come to love such an organisation, will want to belong, and will want to give of their all. How many organisations can honestly claim that?! impossible without a fundamental change in thinking. Where would you choose to work (or live)? Damn, I hadn’t thought about next year’s Test series. This might take a little bit of time and emotional baggage to work through! 1. Kapa haka is the term for Māori performing arts and literally means to form a line (kapa) and dance (haka). 2. 30+ different countries results in amazingly different names to be read out! 3. Every family grouping is presented with a native ‘baby tree’, to plant at home. We’ve got a spot in our garden already sorted. 4. Where this is a particular bone of contention for Kiwis living in Australia. 5. Some countries forbid multiple citizenships, and therefore require you to renounce your citizenship if you want to change to another. 6. You may not think they are random…but if they don’t take proper account of variation, then they are. So I was in a meeting. A colleague spoke up and said that she felt that incentives weren’t a good thing, that they caused much damage and that it would be better to remove their use and replace them with something better. This was followed by the usual conversation that ‘bad’ objective setting is clearly the actual problem…and implied that the (obvious and only) answer was to continually strive to set ‘good’ objectives (incl. targets and linked incentives). some organisations use a ‘profit sharing’ concept and, “really, this is incentives just by a different name… isn’t it?”. lay out a financial methodology to convert this judgement of performance into a (contingent) monetary reward. I have written about the science showing the harm caused by using extrinsic motivators in The chasm and Money as pay. I used the analogy of Don’t feed the animals. I hope that this gives you plenty of thought to explain my contention that, in Ackoff’s words, we shouldn’t be “trying to make a wrong thing righter”. The issue is NOT with poorly set personal objectives, criteria, judgements and financials methodology. You can fiddle with these all day long but you won’t remove the fundamental flaw within. Part 2 – Is Profit sharing the same as incentives? Definition of Profit sharing: All employees share in the success of the organisation. We shouldn’t be implying that some people contribute more to a company’s prosperity than others…indeed some would argue that the most important people are the front line staff and they spend much of their time protecting the customer from the decisions made by command and control managers! Definition of Incentives: Extrinsic motivators – the offering of something (usually money) on a contingent basis in order to control how someone acts. ‘Do this to get that’. At work, such incentives link to the idea of ‘paying for performance/ merit’ i.e. the setting of a challenge and then the judgement as to whether/ how well it has been met and the subsequent release of the contingent reward. Optimising the parts of the system, at the expense of the whole: ‘Meet personal objectives’ usurps overall purpose, with departments, and people within, pulling in competing directions. Static: Once ‘locked in’ each year, people are constrained by this thinking. Optimising the system: Encourages collaboration since everyone (horizontally and vertically) is joined together towards the same purpose. Encourage people to think about the ‘customer’ and their horizontal flow of value. Dynamic: People can continually move in new innovative directions towards the one purpose, liberated from personal objectives. Targets Required as ‘criteria’ for the objectives. People are only truly interested in their own targets. Not required. People are now interested in measures (NOT targets) in how the system works and whether it is improving. Judgement Required to ‘score’ people against. …which occurs due to the impossibility of making a fair judgement. Not required. …and for anyone who holds that incentives must be right because everyone else seems to be doing it, you might be interested in my earlier post on Benchmarking. The greatest sources of motivation are intrinsic. Pay cannot motivate, but pay that is perceived to be unfair can de-motivate. “To break down silos and look at work cross-functionally, an organization has to confront how it approaches incentives, bonuses, performance reviews, and the like. Without a senior leader in place who understands the nature of flow and likely has experienced the benefits of holistic work systems, middle managers’ hands are tied. Without a clear vision from the top, the most motivated middle manager who “gets it” can do very little to experiment with cells. A good friend of mine got talking to me about interview questions the other day. I replied that I think the worst interview question is the “what are your greatest weaknesses”…and then I got thinking about why this is so. you want to be yourself, to be genuine, to be open and honest…. you also want the job! So you’ve been put in a rather tight spot! I’ve read all sorts of ‘clever’ (cheesy) responses. There’s plenty of advice on the web to answer this tricky conundrum, but they all try to do the same thing: get around the question rather than being brutally honest. So, why am I bringing up this dastardly interview ‘weakness’ question? Well, because I realised that this is an excellent parallel to the (ir)regular performance management meeting. If you are part of a ‘set personal objectives – rate performance against – provide contingent reward’ Performance Management system then you too are in a rather tight spot. on the other hand, this same manager has to judge you, which requires an interrogation of the available evidence and the scoring of it, as compared to your peers. You need to sell yourself. These two ‘management’ roles are diametrically opposed. A manager cannot be judge and counsellor/coach at the same time. If you were to lie down in a psychiatrist’s chair, you can expect that he/she will go to great lengths to put you at your ease, make clear that everything spoken is private and that no judgement of you will take place….and even then I suspect that it would take multiple visits before you truly opened yourself up….and in so doing, you provide the knowledge and insights required for you to develop. Now, I know you won’t lie on a reclining chair in a performance review meeting (at least I don’t) but a similar environment of trust is required for a manager to truly help you (and, by extension, the organisation). None of this is to call you a ‘bad person’…you would be merely playing your part in the game of survival that has been put before you. You might get your carrot, but your organisation will miss out on what it really needed to know…and the game will continue on to its next round. Wouldn’t it be just fantastic if you were willing to ‘share it all’ with your manager, and to do so without any salesperson’s spin. How about: where you got it wrong; where you didn’t understand; where you don’t agree, where you feel weak and exposed, where you’d really like some help… where it was actually a joint team effort (not just ‘me’)…basically what is really going on! Even better, how about being willing to have these conversations as and when the need arises (and not, say, 6 months later in some staged meeting). This is possible….but only with a different way of thinking. There’s a reason for the order of these steps: True organisational success is unleashed by point 3…but, most importantly, is held back (even quashed) without first attending to point’s 1 and 2. There are some people who are willing and able to say exactly what they think in a performance management review*, which they do because they have a desire to make their organisation a better place to work (for them, and everyone else)….and then risk the consequences of low(er) ratings and a poor ‘reputation’ with their manager (as in “s/he’s a trouble maker that one!”)…which may even then go on to be ‘shared’ with others in the hierarchy. This is ironic madness. I favour any management system that encourages and supports open-ness and honesty that is devoid of personal agendas. * I’m not suggesting that there is anything particularly great about such people. Such willingness and ability may come down to personality and economic circumstance allowing…which is not so for most. Not everyone can ‘get to the top’. In fact hardly anyone can! Yet many (most?) of us spend our working lives striving to reach the next rung of the ladder…and then find ourselves eyeing the next one. 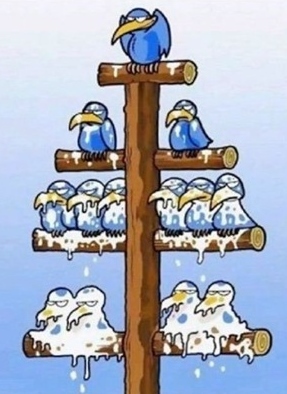 It’s a bit like a pyramid selling scam! “In thinking about promotion, we take for granted that an organisation must be shaped like a pyramid, with many people clamouring for a very few desirable and lucrative jobs at the top, as if this arrangement had been decreed by God. In fact, both how many such positions are available and how many people want them are the result of institutional decisions. The ‘Neuro-Leadership’ scientist David Rock explains that the threat response “is mentally taxing and deadly to the productivity of a person…[the threat response] impairs analytical thinking, creative insight and problem solving.” …and so it would be a very good idea to understand and avoid triggering our threat response1..
Rock explains a set of five social qualities that enable employees and executives alike to minimise the threat response and instead enable the [intrinsic] reward response. These five qualities are: status, certainty, autonomy, relatedness, and fairness. I expect you will understand, and concur with these basic human desires. Here’s the punch line: it isn’t that we want promotion as such – we want what we think promotion implies – we want a feeling of status. Personally, I couldn’t care less what title you give me* or how many people ‘report to me’ or how long I’ve been in my current position…but I understand and accept that (as a human being) I care about status just like the next person. So, if the number of management positions is (and always will be) limited AND it isn’t actually about promotion…then what can we do/ how can we act to look after everyone’s feeling of status? …and these new skills are then used in yet more meaningful work….and back round the virtuous circle. If I am doing meaningful work (to me and the organisation), I am constantly growing as a person and I am being suitably valued then I’ll be fully engaged and pretty damn happy with things. This now links nicely back to ‘part 1’ : If I am able to self-develop then perhaps I have achieved the first step of eligibility for promotion. “Value has a strong impact on status. An organisation that appears to value money and rank more than a basic sense of respect for all employees will stimulate threat responses among employees who aren’t at the top of the heap. In short: The practises of judging people and making them compete with each other aren’t going to help! If ‘status’ in an organisation is all about your position within a hierarchy then this creates a limited and circular line of thinking, within management and employees, whereby promotion is the aim (rather than a responsibility). Rather than spending our time talking to everyone about transparent promotion paths and career development “so you too can get to the top”, let’s spend it ensuring that everyone has a feeling of status. A healthy feeling of status should be attainable by everybody in every position. Whether this is the case will depend upon the management system in place, and the resultant environment that it produces. It is worth noting that ‘Performance reviews’ provoke the threat response because the person ‘passing judgement over us’ puts us on the defensive and appears, to us, to be claiming superiority over us. We find ourselves fighting for survival. I suspect that a really good ‘test’ of the meaningfulness of work to you is how you feel when someone outside of your working life (say your partner, children, family or friends) asks you what you do. Is it painful or easy to respond?! David Rock notes that “paying employees for the skills they have acquired, rather than for their seniority, is a status booster in itself. This is a very different logic to ‘incentive pay’. 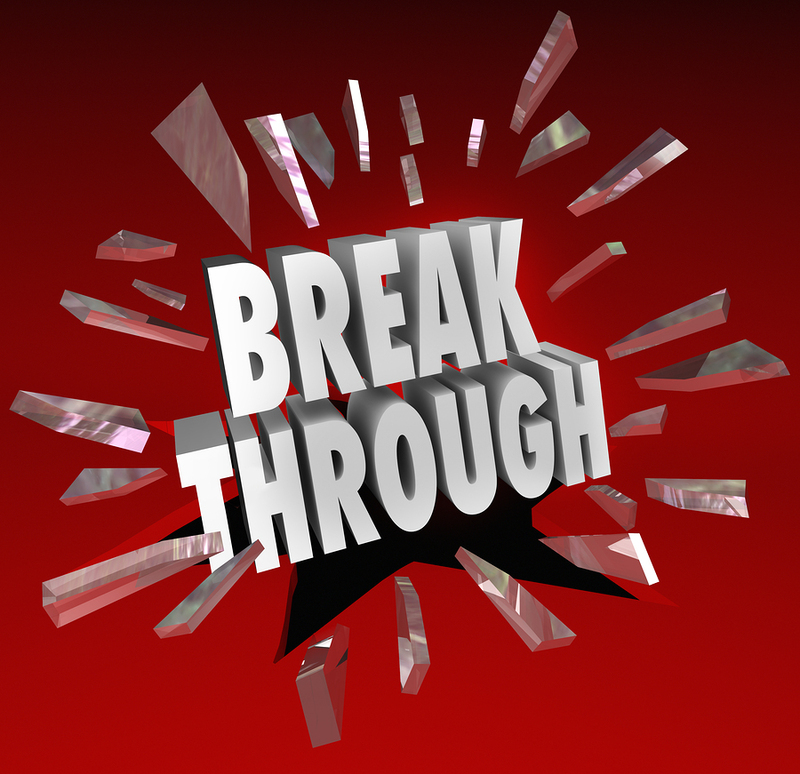 A breakthrough!…but is it all that it seems? Telecom [will] stop using online forms to appraise staff performance, reverting to a “far lighter” system of one-on-ones and “adult-to-adult conversations” on regular four-to-eight week cycles, he [Simon Moutter, CEO] said. Caveat: Looking at this 2015 Spark site, I’m not sure whether they successfully ‘broke away’ from the past…the picture at the bottom looks remarkably familiar! A reminder: I have written quite a bit on the subject of performance review. In particular see An exercise in futility. What I find highly ironic about professional services firms eulogising about their new found wisdom is that they have large ‘human capital’ consulting arms that have been selling their wares for decades (I know, I used to work alongside them)…and what have they been earning millions of $ on? Yep, advising on implementing supposedly highly researched incentives schemes and performance review programmes….you know, the ones that they have now decided aren’t so great. Taking a look, for example, at Deloitte’s website, I can deduce that they see a huge opportunity in presenting themselves as (what professional service organisations love to call themselves) ‘thought leaders’ to sell their new-found performance management brilliance (the next Silver Bullet) to all the other organisations out there. I have read the Deloitte HBR article (referenced above) and I see their ‘answer’ as a likely fudge. They talk a lot about the wasteful time and effort expended in the current annual appraisal system. They talk about it not actually deriving valid results (being hugely biased by who is making the judgement). Yet their answer (when boiled down to its essence) is to merely make it simpler – a sort of ‘reboot’. It would appear that they are still asking questions about a person to rate them, which will determine a reward. they appear to be clinging to the idea of motivating an individual’s performance through contingent rewards, and judging them accordingly. I can see that the games people understandably play will simply mutate, yet remain. “Tell me how you will measure me and I will [show] you how I will behave” (Goldratt). Then you can create the conditions for authentic motivation. “If your parent or teacher or manager is sitting in judgement of what you do, and if that judgement will determine whether good things or bad things happen to you, this cannot help but warp your relationship with that person. You will not be working collaboratively in order to learn or grow; you will be trying to get him or her to approve of what you are doing so that you can get the goodies. Many an organisation might read about* what the likes of Accenture are doing and conclude that, clearly, they need to copy them. But a reminder of the dangers of copying: Yes, look at what others are doing and, yes, be curious as to why…BUT you need to work it out for yourselves – you need to ‘get’ why it is the right thing to do and then adapt it accordingly. Otherwise you can expect one great big mess. I’m unmoved (being polite) by their commissioning/ invoking of seemingly new and brilliant research that arrived at their ‘new insights’. …go back even further to what Deming and the Japanese were doing from the 1950s. During this time, the majority of large corporations have been pushing in, and constantly justifying, the exact opposite of where they have arrived at now. I think it is disingenuous, arrogant (or maybe ignorant) of any organisation that does not (outwardly) recognise that what they have just ‘discovered’ has been there, loud and clear, in front of their eyes all the time. Relax, don’t worry about the title: I will be limiting this post to ‘work relationships’…and I don’t mean ‘relationships at work’. Peter Scholtes wrote that, to understand people, we need to understand relationships. In particular, leading people requires the establishment and nurturing of personal relationships on a daily basis and the encouragement of others to do the same. Each knows the other well enough to know their vulnerabilities and cares enough to avoid them. Now, relationships are hugely important between manager and employee. Unfortunately, these relationships in most organisations are patronising and paternalistic. Child: from playful and creative through to rebellious and spiteful. Command and Control management systems necessitate ‘management’ to assume a parent ego state, which often ends up causing the employee to adopt a child-like ego state in reaction. The words ‘boss’ and ‘subordinate’ (both of which I dislike) fit this parent – child relationship narrative. In reality, we are all adults at work. It just happens that we are employed to play different roles – from helping customers through to running a business division. It is each leader’s choice as to the ego state they adopt…and therefore the likely ego state that their employees will take in response. As an example: I find it odd when a manager verbalises to ‘their’ employee that what they are about to say to them is a ‘coaching moment’ (i.e. “…so listen up and take note!”) – how much closer could you get to a parent – child presumption by the manager? It’s akin to what my youngest son refers to as “getting a lecture” from me. Pointing out to someone that ‘this is a coaching moment’ is patronising and presumptuous and demonstrates an (often sub-conscious) intent to enforce a superior (‘alpha’)/ inferior relationship signal…and it generally breaks point 1, so it isn’t actually coaching. Right, coaching rant over, back to it…. Leaders need to recognise that we are all people (organistic systems), with our own separate purposes (just like them). The need is to establish adult-adult relationships, in which no one sets themselves out as being ‘above’ or ‘better’ than anyone else. If an organisation’s leaders succeed in this then they will have created a hugely powerful environment. I find this figure illuminating. 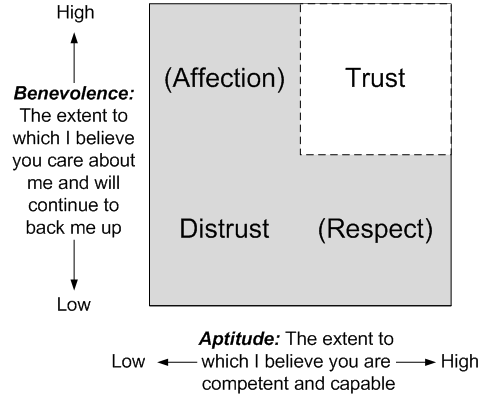 It makes me see that (and understand why) I have had some managers that I have respected and some that I have had (professional) affection for…but trust is much rarer. 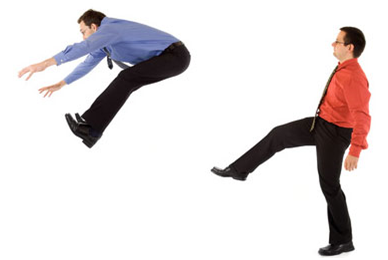 Some command and control managers have the view that employees need to earn their trust…this is the wrong way round! If someone wants to lead, they have to earn the trust of those that they would like to follow them. Now, onto the idea of KITA management: the term ‘KITA’ was coined by the psychologist and Professor of management, Frederick Herzberg (1923 – 2000)*. It stands for Kick-in-the-(pants)…he was too polite to write what the A actually stood for. The related problem with KITA thinking is that it locks manager and employee in a highly unhealthy parent-child relationship. Further, when rewards are competitive (which they usually are in some way) KITA thinking creates winners and losers and adversarial relationships among those who should be colleagues. * Note: Herzberg wrote the classic 1968 article “One More Time, How Do You Motivate Employees?” This is one of the most requested HBR articles of all time and has sold well over 1 million copies. If your parent or teacher or manager is sitting in judgement of what you do, and if that judgement will determine whether good things or bad things happen to you, this cannot help but warp your relationship with that person. A powerful inducement has been created [through the regular judgement and resulting outcomes] to conceal problems, to present yourself as infinitely competent, and to spend your energies trying to impress (or flatter) the person with power…. …and, in so writing, Alfie eloquently uncovers the damage caused by rewards and the stunting effect they have on the ability of an organisation, and its people, to improve. The positive bit: It would be great if all of us worked really hard to attain an adult-adult relationship footing…realised when this had been broken by our words and deeds …and, through humility and dialogue, worked even harder to bring it back again. An apology: I have a rule that a post should only cover one thing…and this one doesn’t appear to! It’s a bit of a journey from relationships, through leadership, coaching, trust, motivation and ending at rewards, which brings it full circle back to what rewards do to relationships.